Need a homemade Christmas gift idea that even the most craft-challenged person can make? I have just the thing. A paracord lantern. It’s quick, simple and inexpensive, so make several. I’m sure there’s someone on your list who would enjoy lighting their backyard or camp with these colorful lights. Start by melting the wax. Fill the large stock pot with water and bring to a boil. Put the wax in the small stock pot and then set it inside the larger stock pot. Using this “double boiler” method helps melt the wax at an even temperature which prevents it from burning. Place the candle wick inside the jar. (Don’t worry about centering it at the moment.) When the wax is completely melted, pour it into the Pyrex measuring cup and then fill the mason jar to your desired level, but make sure you leave at least 1/2 inch of head space at the top. Center the wick and hold it in place with 2 spoons resting crisscrossed on the jar rim. Let the wax cool completely and then trim the wick to 1/4 inch in length. Gather the 5 strands of paracord together and feed them through the metal key chain ring. Place the ring at the center of the strands, fold the strands in half and tie a knot below the ring. Next, take 2 neighboring strands and tie a knot approximately 10 inches down from metal ring. Repeat until all the strands have been tied, creating 5 sections. Start with the first section. Take the right strand and then left strand of the next section. Tie them together 2 inches from the above knot. Repeat until all strands are tied. Then gather all the strands together and tie one large knot approximately 3 inches down. Melt the end of each strand using your lighter to prevent unraveling. 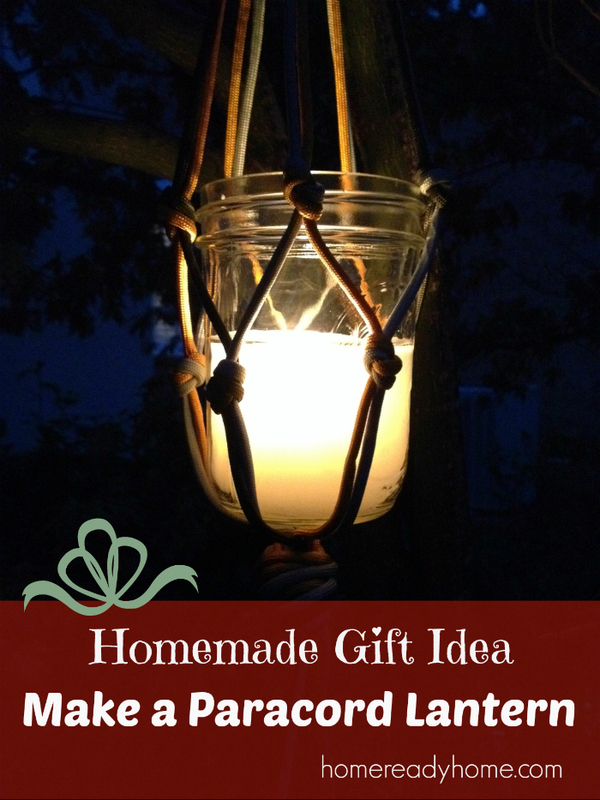 Place the mason jar candle in the center of the paracord hanger. Easy, right? They’re gonna love it!